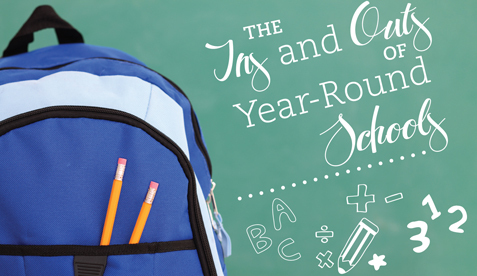 If you’re new to the area, or to the public school system, you may have some questions about year-round schools. You are not alone. The debate continues among parents and educators about whether the traditional or year-round format is better for test scores, family schedules and continuity in the classroom. Each calendar system is loved by some and hated by others. Before you decide which works for your family, make sure you have all the facts. Year round schools were instituted to accommodate the tremendous growth that Wake County Public Schools have experienced. Year-round schools can accommodate 20–30 percent more students in the same facilities as traditional calendar schools. Out of the 163 schools in Wake County, 40 are year round. The bulk of those 40 schools are elementary. A track is a group of students following the same schedule. The majority of year-round schools in Wake County operate on a multi-track system, typically with four tracks. Each track’s schedule is staggered so that one track will be on break while the other three are in session. Single-track schools maintain a year-round schedule shared by all students. Track schedules are consistent from school to school. If your child is on track 1 at Adams Elementary he or she will be on the same schedule as track 1 at Ballentine Elementary School. Year-round students are in session the same number of days as traditional calendar students. All North Carolina pupils receive 180 days of instruction; the difference is the way the vacation time is allotted throughout the year — either in a large block during traditional summer or more frequent breaks on the year-round calendar. Holidays, such as Labor Day, Thanksgiving and Christmas, are generally shared between year-round and traditional calendars, but be sure to check your specific track for any possible changes. Students stay on one track for an entire academic year. If you would like to change tracks, the request must be made between years to the school principal. The year-round school year begins in mid-July for three tracks. The remaining track begins 15 days later when another track rotates out. Every student is assigned a base school and a calendar option school. If the base school is year-round then the calendar option would be traditional, and vice versa. Students can request a transfer between these options during the spring transfer period. The Wake County Public School System website has a great tool for residents to find their base and calendar option schools called the Student Assignment Finder. If a transfer is approved, families may have to arrange their own transportation. School assignment is currently under review and Superintendent Tony Tata is constructing a plan that incorporates community-based parental choice. Look for the details of the new plan to be released in October. Students in seventh and eighth grades are eligible to participate in middle school athletics. Sports seasons align with the traditional calendar, and athletes who are tracked out during part of a season will still be expected to attend practices and games. Each school may have an individual policy for excused absences during track outs, so be sure to check with the coach. For more information check out the Wake County Public School System website, www.wcpss.net.